You might do what you do everyday, get up at the same time, drink your favorite coffee and walk out the door, but do you know if you will be alive in the next minute? Do you know if someone will stop you on the street and offer you a modeling job because you're just the face they're looking for? Do you know if you will get a call from your child's school telling you she's been in an accident? Moving to another city is daunting, but moving abroad is even more scary. At least moving cities, you (usually) speak the same language, have the same culture, eat the same food. Now, when you move from the US to China or from Indonesia to Argentina, things will be different. Of course they will. The lifestyle might be different, you don't understand their jokes, you don't have friends, you feel bloody helpless at times. I get it. What if you never try? What if you don't give your children the opportunity to encounter another culture, what if you actually enjoy? I am certain that many people around the world who were planning to move to Paris in a few months are thinking about changing their plans, even people who were planning on just going there on vacation might be thinking of going somewhere else. And I tell you now. Please don't. Stick with your plan. Go an travel to Paris, enjoy the amazing beautiful city it is. Live like a Parisian, learn french, enjoy their food, drink their wine. Paris has been hurt too much already, it needs people coming over, visiting the city, enjoying its beauty (which expands much further than just the Eiffel tower, I tell you). What if you decide that no, Paris is too dangerous, and you go to Sidney, but then you get robbed or worse, you don't go anywhere, stay in your city and you get kidnapped? Or what if you do go to Paris and you have the time of your life? We don't know whether we'll wake up in the morning, but one thing we can be certain, we are in this world to live life to our full potential, to have fun, to love and mainly to be happy. Who would have thought that Sep 11th would happen? I lived near DC at the time, everyone was paranoid, of course. My family in Brazil was worried, but to the best of my abilities, I made sure I was making myself useful, by volunteering to work longer hours where needed, by living life and trying to make sense of what was going on. So, you live in this tiny little town where everybody knows everybody, and you like life just the way it is, pick the kids up from school, stop at the grocery, go to the office, etc. Then some crazy maniac comes in and shoots everyone in a high school football stadium. It happens. It's happened before. In 2015 alone, there has been 325 mass shootings in the US. What I really want to bring to life is, we never know how our day is going to turn out. Unexpected things happen all the time. Many of them are great, but sometimes they're bad things and usually they happen to very nice people and it's hard to cope with it, to understand them. 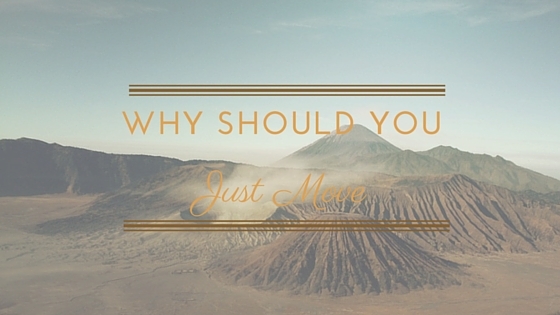 Your decision to move abroad shouldn't be dependent on events that happened. Of course, I am not telling you to move to a war zone, such as Syria, Iraq or Afghanistan, that would be nuts. Yes, you should consider every place carefully, weight in the pros and cons, but it shouldn't be the only thing that determines your future. What if you move to Paris, and you meet the love of your life? What if you don't move and miss out on it? If my life hadn't followed the path that it did, if I hadn't been at a certain birthday dinner party, with the same group of friends I might not have met my now husband of 13 years. Life is a big question mark. Don't forget, for Parisians, that was home, their routine, their safe place. I've been thinking a lot about Paris, about what happened, trying to come to terms with something that we can't really make sense of. My cousin was living there about a yr ago, she said she was 2 blocks from one of the places where it got hit. For her it must have hit home really hard. Don't give up on what might be the best experience of your life because of what you're afraid it might happen, chances are all your fears won't come true. Think of the possibilities, of all you can accomplish, all you can see and do in your new place. Be it DC, be it Quito, be it Amsterdam. I'm super excited, and happy to what the future holds, but someone else in this household isn't. Victoria doesn't want to move. She's 8. She is a little social butterfly who loves, loves, loves being with friends, playing and enjoying life. As soon as we found out that we were moving, I told her, she didn't like the idea, but put up with it. We have talked over and over again. Paul and I are often throwing hints, about all the friends she is going to make, all the cool stuff she will see and do, but today, after spending the weekend with her best friend, Victoria cracked down. She wants to be with her best friend forever, she's afraid she'll never see her friends again and I can't blame her, I don't know when she's going to see her friends again. All we can do is try to comfort her, tell her we understand, let her cry as much as she needs to, but also stating calmly the reasons for the move, how it happened, why we are going where we are, and whatever other information she might need. Just saying: "Don't worry, you will make loads of friends" doesn't work when she's in that state. She doesn't care that she will be making new friends, that means nothing to her. She wants her friends, at this point in time, no new friends will help. Will she get over it? Of course. Will she bounce back? Not a doubt. But at this point in time, she's hurting and we need to just listen and love her. After a long cry, a few matches of Uno Dare was great for a few laughs. I also read "Moving Planets isn't easy" to her. A great little book I found on Amazon about moving with kids. I highly recommend it for kids over 6. They have it in Spanish as well. Does Your Insurance Co. Send you a Birthday Card? Today I received the yearly card I get from my insurance provider and I thought about writing this post, since it's a very important thing to think about depending where you're moving to. One very distinct difference between Brazil and the US or England or Switzerland is that Brazilians (in general, with a few exceptions) don't like paying for stuff they don't think they need. If they don't think they need car insurance or house insurance, or worse, health insurance, they won't get it. I never learned how important it was to have all of that until many years after I had left the country. In the US you have insurance for everything. Is it a horrible industry? Yes, do I like insurance companies? Nope, but it's a necessary evil. And my opinion is, get the best that you can afford at that point in your life. If you then get a better job and can afford a higher premium, with a better company, go for it. My insurance is State Farm. I looove state farm, ok, maybe this is an exaggeration, remember, it's a necessary evil. No, they're not paying me to say that, it's just the opposite really, I'm paying them a lot of money yearly, but they are good. When I lived in S. Carolina, and got my first car ever, I went with Allstate, it was cheaper and it, but then I had a problem and they weren't helpful at all, made everything so difficult, that I changed. I hired State Farm. What a difference. They made my life so much easier. They aren't on the cheaper side, but at least we know they will get it sorted. A few months ago, I bought a new car, it wasn't even 3 months and when I was riding the freeway, a stone hit the windshield, making a big damage. The crack was getting bigger by the hour, especially with the hot weather. Within a day of calling them, they had sent someone to replace it. Price - always check not only what the premium will be, but any hidden costs. Do they offer a discount if you pay yearly or maybe if you have car/house/life insured with them? Ah, and in some states the rates are set by law, which means that if you're paying a cheap price, you're not getting all the coverage you would. Coverage - what will they cover if something happen? Does the company you are talking to cover everything you need? Deductible - how much will you have to fork out if anything happens? Access - can you reach them easily? Is there a live body you can talk to? Do you feel comfortable when you visit their office and speak to them face to face? Do they return phone calls? How to Make the Best of Your Area Orientation Tour? Sometimes you will move and that's it, you've never been to the place before, you don't get a chance to and it's all a big surprise. On the other hand sometimes your company (or your new company) will give you a weekend/week/day for an area orientation tour. When I worked in Real Estate I did a lot of relocation tours. I loved it. I did national and international tours. On that note, here are a few things to make it work for you. Try to get your company to at least give you a full day. I've seen people with half day house tours. It's hard. Be open-minded when you visit somewhere new. I've heard someone say that after spending 1 weekend in a certain foreign country, they rejected the company's offer to move. I understand that it can be overwhelming, but visiting a place with jet lag, tired, sometimes is not ideal, so keep an open mind and don't focus on the negatives. If the company hires a real estate agent, make sure that you give him/her as much info as you can, they will be working to help you, but they can't do it properly if you don't offer candid feedback on what you need/want. If you are scheduled for a day, let's say, a Friday with a professional, book your return flight for Sunday evening. Try to spend the weekend not sightseeing, but going to a local event instead, with locals. Bring your spouse, if you can, or have them on Skype/hangouts. It will save you time when making decisions after. If they can't come for any reason, video places or inside homes, it will help your spouse feel as part of the decision. If you have kids, arrange to visit schools. If a realtor or a relocation company calls them in advance, they can arrange a visit. If you are looking to be near lakes in Arizona, take a deep breath and again, be open-minded... there aren't many around here. Even if they show in a map, it doesn't mean they aren't dried up. Again, be open-minded. Did I say, be open-minded? I started laughing, that nervous laugh and she asked if that was true, without thinking I said yes. I didn't really mean to, but I didn't know what to say. It wasn't expected. I didn't have a speech planned. For Santa, I have a speech, for the tooth fairy too, but that? The S.E.X word??? I don't! I didn't! Now it's too late, it's happened. So, to make it even better at the end, she said: Please don't tell me that this is what happened between you and dad. And I did my um, um, um thing, not knowing what the heck to say, I said it was bath time and that she had to go, like NOW! And I sit here wondering, will she remember this conversation? Have I traumatized her forever? What the heck do parents say to this question? Why are 8 year olds talking about that? Am I a bad mum? A bad person? I mean, I consider myself pretty open minded, but... seriously, this was tough.